Rorschach and I hard at work. Well, so my Thing-A-Day run for February 2013 has finally come to an end (after another delay over the weekend: I ended up spending about 36 hours hanging out with the in-laws and their kids and it was totally worth it). The plan now is to let the draft sit for a bit (maybe a couple of weeks at this point, we’ll see what happens) then start re-writing it in order to publish. Already, I’m envisioning radical revisions so the following draft(s) likely will only bear superficial similarities to what has been posted here over the last month. That being said, I will be setting aside a separate page for the text on this here blog so that readers (should they desire) can eventually compare the rough draft with any future version that gets published. As well, expect a continuation of the “Flash Fiction Challenges” (I’m already cooking the current week’s challenge and should have it up in the next day or so) along with periodic updates and posts regarding other projects I’m working on (currently, one of them being a short story anthology revolving around the Grail-esque relic mentioned in Journey to the South as “the Raiment of Stars”). 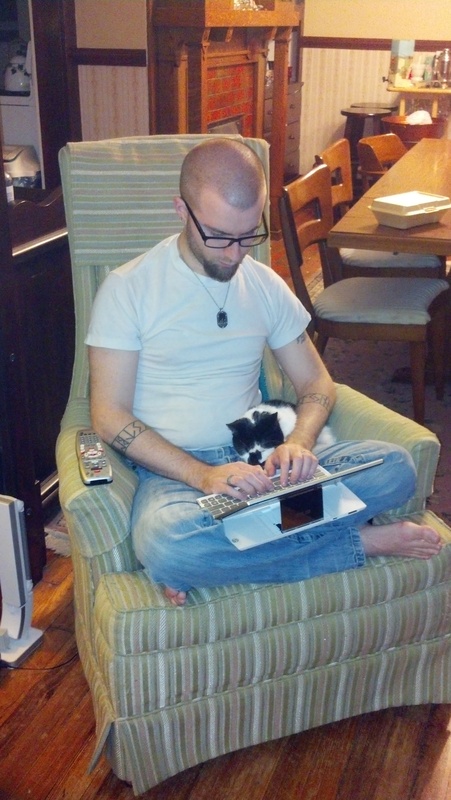 So, until then, enjoy the picture to right of me and one of our cats diligently working on last night’s update.